Great deals to Amsterdam up to -70% off To take advantage of these offers, join now for free! Famous for its friendly vibe, the welcoming city of Amsterdam offers its visitors an abundance of contrasting culture, fascinating heritage, and an atmosphere that is unique to this Dutch city. Amsterdam is easy and quick to get to from many UK airports making it ideal for a short city break. It doesn't matter if you're looking for a quiet getaway full of walks and museums, or a trip that is bursting with activities and lively nightlife, this fine city caters for all. Just a short hop from many UK airports, Amsterdam is the perfect location for a city break. With the elaborate, winding canal systems and beautiful art galleries, the capital of the Netherlands is a jewel in Europe’s crown. Popular with couples and families, the picture-postcard setting lends itself to gorgeous photography – both in the day and as night falls. Having firmly shaken off being the stag do capital, Amsterdam is a place to indulge in heritage and history. 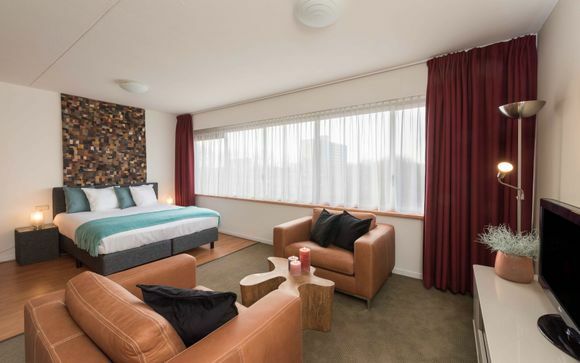 Whether you’re looking for a couple of nights away to relax, or want to soak up some culture in one of the world’s most picturesque cities, our Amsterdam deals will make sure you get a luxury break at a fraction of the cost. 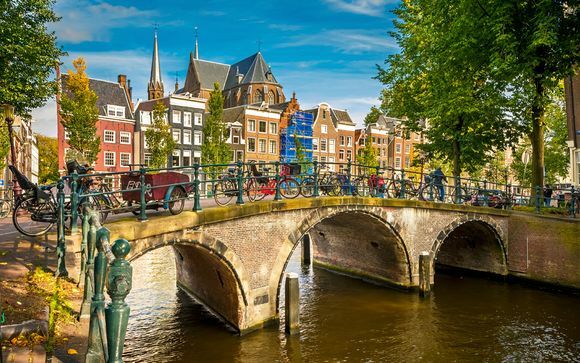 Amsterdam is the perfect luxury destination for any kind of traveller - with safe cycle routes around the city, accessible streets despite the cobbles, and great public transport, you can cram as much, or as little, as you like into your city break. Which is good because Amsterdam is bursting with picturesque streets and markets, among many other things. 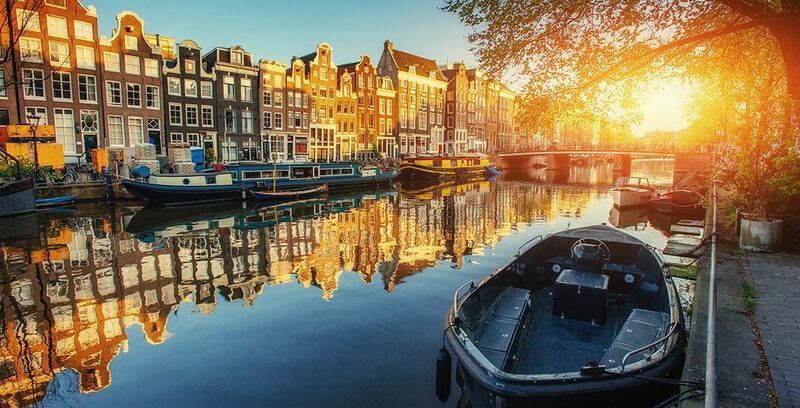 With great deals to Amsterdam, there's never been a better time to check this great city out. For the Dutch, cycling is a way of life - there are 400 kilometres of cycle paths in the city and 58% of locals choose bicycles as their main method of transport. Bicycle rental businesses are available all over Amsterdam with many offering bikes for different needs, including those with small children and disabled people. There are also a whole variety of guided cycling tours for a more environmentally friendly and healthy way of seeing the sights. Contemporary art fans will most probably have Stedelijk Museum, dedicated to the last 150 years of modern art and design, on their list already, but there are dozens of other contemporary art galleries including Mediamatic, De Appel and W139. 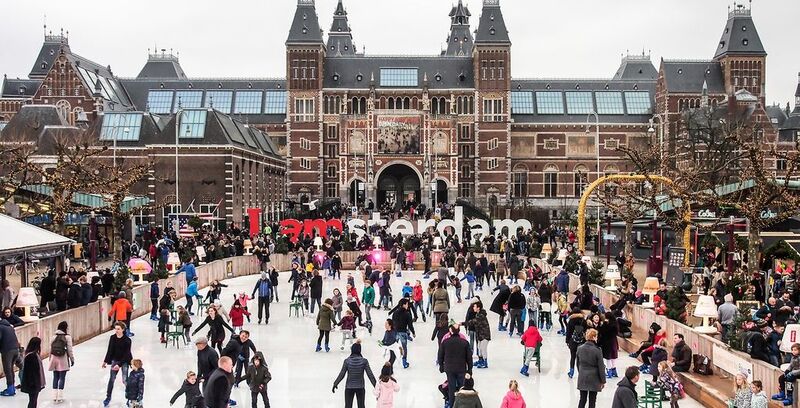 For those seeking famous art from the region, the Rijksmuseum and The Van Gogh Museum houses art from famous locals such as Rembrandt and, of course, Vincent Van Gogh. The Anne Frank Museum converted from the home where she wrote her famous diary, is an important, reflective and poignant stop for many visitors. For those who love good food, Amsterdam is packed with excellent cuisine, from vans selling traditional raw herring to Michelin starred restaurants. Westergasfabriek is a cultural hub hosting a diverse collection of luxury restaurants, hip eateries and bars. De Hallen is a former tram depot with over thirty food stalls and a weekly food market, ensuring something delicious for everyone. 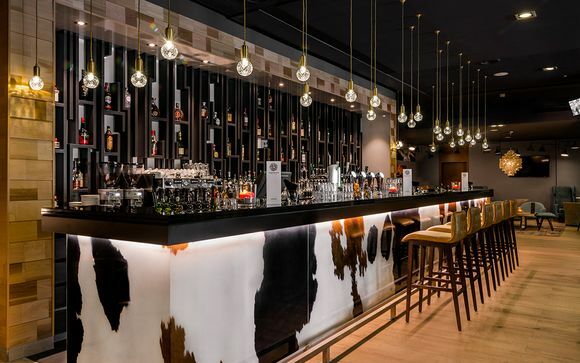 The many bars, nightclubs, and restaurants in the city make Amsterdam a fantastic place for those seeking a city break filled with exciting nightlife. With over thirty parks in the city, enjoying the outdoors is important for locals. A whole variety of park-based activities and events take place throughout the year, such as the annual roster of music festivals and the celebrated open days, where canal-side houses and museums invite the public into their gardens. For those travelling with small children, Norderpark has a wonderful playpark for little adventurers. The famous flower markets around the city are the perfect place for a leisurely stroll and make for some great photos. Amsterdam is an ancient city with a colourful history that's preserved in the cobbled streets, ancient buildings, and Dutch windmills. A great way to see the city is by cruise, giving you the chance to take in the sights that sit on the banks of the 17th-century canal. For sightseers who love modern architecture, the Scheepvaarthuis illustrates the classic style of the Amsterdamse School, and the recently developed EYE Film Institute is a great example of multi-functional contemporary architecture. If you are travelling with children, then Artis Royal Zoo or one of the many smaller petting zoos around the city are ideal places for little ones to let off steam. 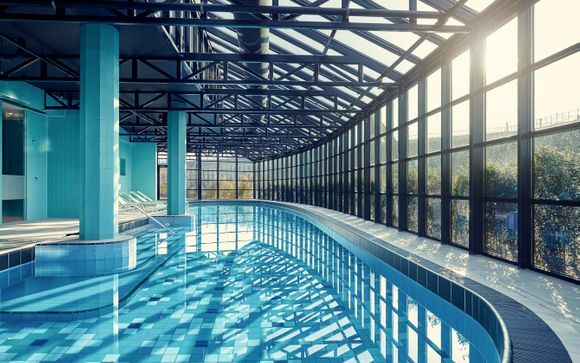 The Best Western Delphi is a welcoming and modern hotel located in the centre of the city with fantastic transport connections to attractions, amenities and the airport. 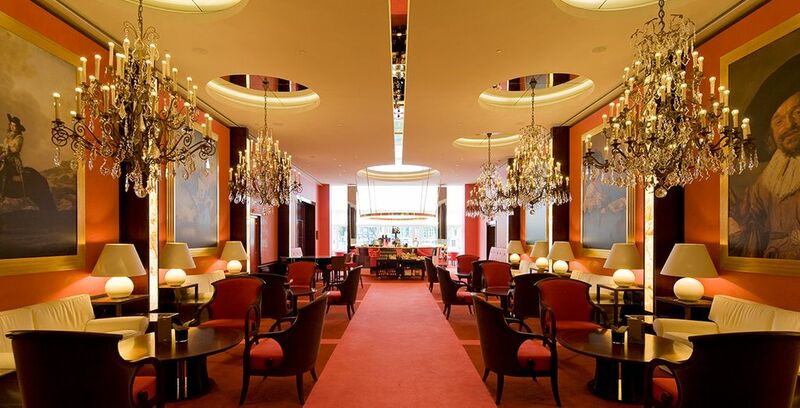 The hotel bar and lounge is a great place to unwind after a day of sightseeing. 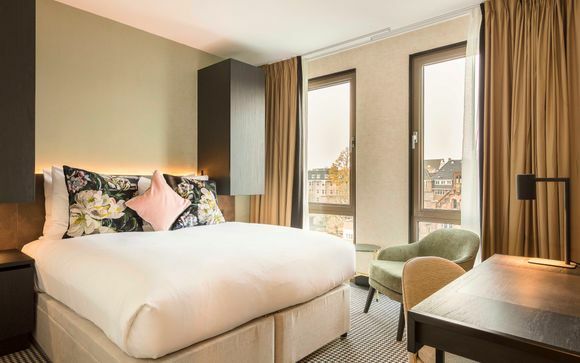 Nestled in Amsterdam's Fashion and Art district, Pillows Anna van den Vondel is a boutique hotel housed in a traditional Amsterdam townhouse and makes an ideal escape for modern lives. It's just a short walk away from the cultural and vibrant neighbourhood and two of the city's major attractions, the Rijksmuseum and the Van Gogh Museum. 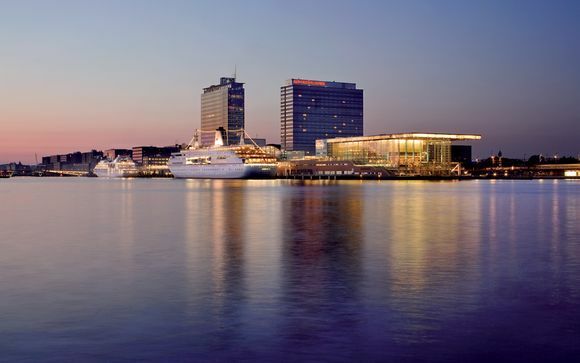 For those seeking luxury, QO Amsterdam 4* is a fantastic choice. 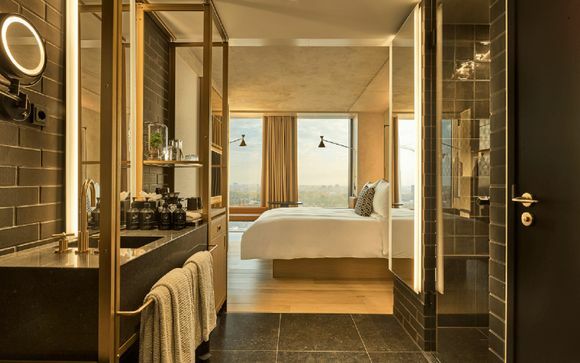 With stylish rooms that have sensational views of the city, professional and friendly staff, and an ideal location near to main attractions, this boutique hotel will leave you feeling rested and ready to face either a day of relaxation or sightseeing. There’s only one way to explore Amsterdam’s cobbled streets and winding roads, and that's by bike. With great deals to be had on bicycle hire for the day or week, getting on two wheels has never been more appealing. There are more than 400km (nearly 250 miles) of cycle paths through Amsterdam. Pick up a map and explore the canals and side streets at your leisure to get a real taste of the city. 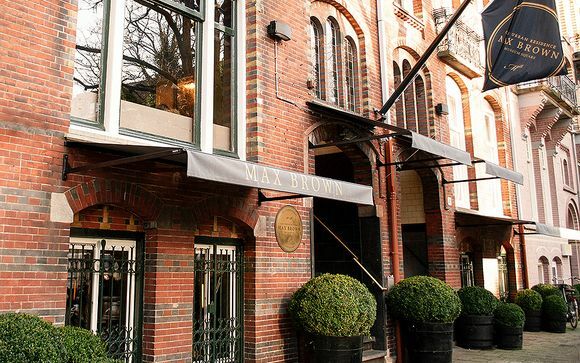 And after a day of cycling, how better to relax than in one of Amsterdam’s luxury spas? Discover the birthplace of Vincent van Gogh as you stroll through the many wonderful art galleries of Amsterdam. World-class museums such as the Stedelijk museum of modern art and the Rijksmuseum are a perfect place to escape the crowds and find time to reflect. Buildings dating back to the 17th century sit alongside cafes, bars and coffee houses, breathing history into the streets and giving you a sense of time passing in the Museum Quarter. 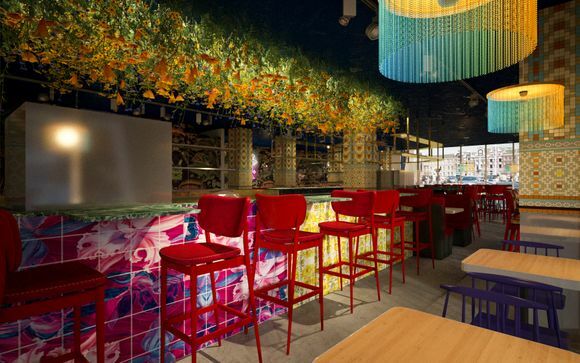 And once you’ve feasted your eyes on the artwork of Amsterdam, the city plays host to a wide array of fine dining with Michelin-starred restaurants adding a touch of luxury to your city break. But if you want to dine like a local, there are also plenty of places to pick up a traditional meal. To enjoy more amazing offers like these, sign up to our website. Amsterdam's climate is similar to the UK, with cold winters and warmer summers. During winter the temperatures can drop to freezing with daylight only lasting an average of seven to eight hours. It can rain or snow a lot in Amsterdam over the winter, however, the city is beautiful in the snow and the many museums, cafe's and restaurants make for great shelter during rainy bursts. Spring is a great time for those visiting the flower markets which come to life with the transition into Spring. The average temperatures are around 9° / 2° - 17° / 8° between March and May, but it's good to be prepared for spring showers as the weather can be varied and change throughout the season. The summer months between June and September bring average temperatures of around 22° / 13°, with approximately ten rainy days each month. This makes Amsterdam a great choice for cycling and sightseeing as it rarely gets too hot. Autumn is relatively warm with occasional rain showers, similar to Spring. With great deals to Amsterdam, this fun city has year-round activities and events, now is the time to book. What sort of budget to plan for Amsterdam? Public transport in Amsterdam, including the buses and trams, can be great for those travelling on a budget. You can buy hourly or daily top-up cards known as OV-chipkaart, which can be used on all public transport services. If you want to travel like a local, hiring a bicycle from one of the many competitive bike hire places throughout the city is an affordable option. You do need to pay for the museums and attractions like the zoo in Amsterdam, with prices varying. It's always good to research, however, as there are lots of online deals worth checking out if you're travelling on a budget. The restaurants around the city do differ slightly in prices. 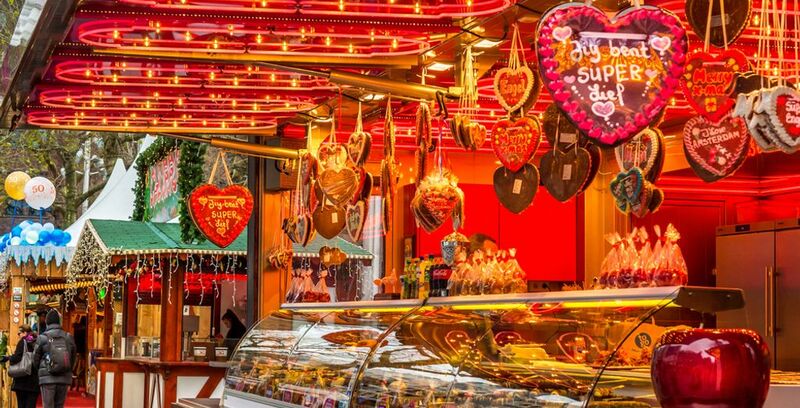 There are Michelin starred restaurants providing fine dining, but there are also food stalls, markets, cafe's, and takeaways throughout the city, providing cheaper food, which is especially good if you're on the move. Our great deals to Amsterdam mean you can spend as much or as little as you like around the city. Returning to one of our comfortable luxury hotels at the end of a long day cycling or sightseeing is a real treat. Discover more offers on Amsterdam: booking, holidays, travel guide, last minute deals, stays, weekends.